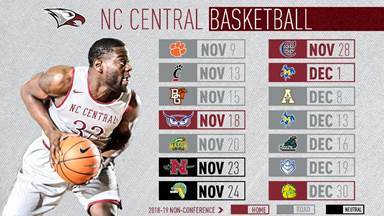 DURHAM, N.C. – The North Carolina Central University men’s basketball program has announced its 2018-19 schedule, featuring 30 games and 12 home dates. The Eagles will play 14 non-conference games comprised of four home games, eight away contests, and two neutral-site games at the Emerald Coast Classic in Niceville, Florida on Nov. 23 and 24. NCCU will open the campaign at Clemson on Friday, Nov. 9, meeting the Tigers for just the second time, and the first time at Littlejohn Coliseum in Clemson, South Carolina. From there, the Eagles will head to Cincinnati on Nov. 13 before finishing the season-opening road trip at Bowling Green on Nov. 15. Bowling Green is one of three first-time opponents on the schedule, followed by Nicholls State during the Emerald Coast Classic on Nov. 23, and a visit to Saint Louis on Dec. 19. NCCU will “Protect The Nest” at McDougald-McLendon Arena four times in the non-conference slate, beginning on Sunday, Nov. 18 against Warren Wilson. The Eagles are next home against Christendom on Wednesday, Nov. 28 and McNeese State on Saturday, Dec. 1, before closing out the calendar year against Wilberforce on Sunday, Dec. 30, as the Bulldogs will face NCCU for the first time since 1998. The Eagles will spend the Thanksgiving holiday on the road, beginning with a return trip to George Mason on Nov. 20, before heading to Niceville, Florida for the Emerald Coast Classic against Nicholls State and either Southern or Western Michigan on Nov. 23 and 24. NCCU last competed in the Emerald Coast Classic in 2014, where it won the visitor’s bracket against Eastern Illinois and Northern Arizona. NCCU finishes the road portion of the non-conference schedule with a four-game swing that starts on Dec. 8 at Appalachian State. The Eagles then head to McNeese State on Dec. 13, and Coastal Carolina on Dec. 16 before playing their final game before the holiday break in the Gateway City against Saint Louis on Dec. 19. NCCU will face each Mid-Eastern Athletic Conference team at least once in a standard 16-game schedule with an even eight home and road games. The Eagles’ MEAC opener will be at home against Bethune-Cookman on Saturday, Jan. 5. NCCU will also host Coppin State, Morgan State, North Carolina A&T, Maryland Eastern Shore, Delaware State, Savannah State and South Carolina State. NCCU’s first matchup with NC A&T will be at home on Saturday, Jan. 26, and the season will finish on Thursday, March 7 at the Corbett Center in Greensboro, North Carolina. The Aggies are one of five teams the Eagles will face twice during the season, with the being B-CU, MDES, DSU, and SSU. The MEAC Conference Championship will be played March 11-16 at Scope Arena in Norfolk, Virginia. For the full schedule and ticket information, visit www.NCCUEaglePride.com. 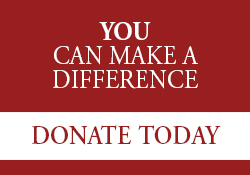 Contact with us through our representative or submit an inquiry online.